This meeting is completely devoted to the remembrance of the Lord Jesus Christ as He requested (Luke 22:19). The elements on the table are symbols of the body and blood of our Savior. The order of the meeting is simple and according to the Word of God. Various men will take part as led by the Holy Spirit. Some will give hymns, some may read appropriate Scriptures and others may express worship, appreciation, praise or thanksgiving to the Lord in prayer. This is not our "teaching" meeting. Its a time of reflection on and worship of our great God and Savior. If you have not yet put your faith in Christ as your Lord and Savior, you are welcome to observe us in worship, but we ask that you refrain from the bread and cup as they are passed. Everyone trusting in Christ for eternal salvation and living in fellowship with Him is encouraged to partake of the elements in remembrance of the Lord. There is a choice of wine or grape juice. Grape juice is in the outer ring of the tray. Those who are not yet believers, or for some other personal reason do not wish to take part, should merely pass the trays along. During this meeting an offering is received from the believers who wish to give. In accordance to God's Word, the sisters are not permitted to speak publicly in the meeting. However they may participate in the singing of the hymns and in silent meditation and silent prayer. In all our meetings, the men wear no head covering while the women do (I Cor. 11:2-16). If you have any questions, please Email Us, we will be happy to provide you with more information. 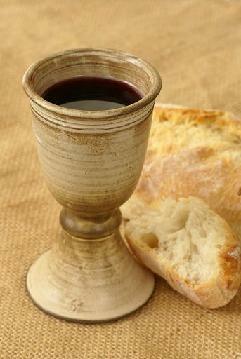 "...For as often as ye shall eat this bread, and drink the cup, ye announce the death of the Lord, until he come. "